Whether you work in the home, outside the home, are on the road, are retired, have 4 kids at home or are empty-nesters, you have a life to live and probably enough going on in that life to need some organization. I know I do. I work at home, mostly. I pick up paid-work whenever I can. I volunteer about 4 days per month. I have personal appointments, regularly. I have home maintenance appointments, sporadically. I have 5 adults that I cook, shop and clean for. I maintain all of the financial obligations for the household. And I blog 5 days per week. It's all very doable -- if I keep myself organized. 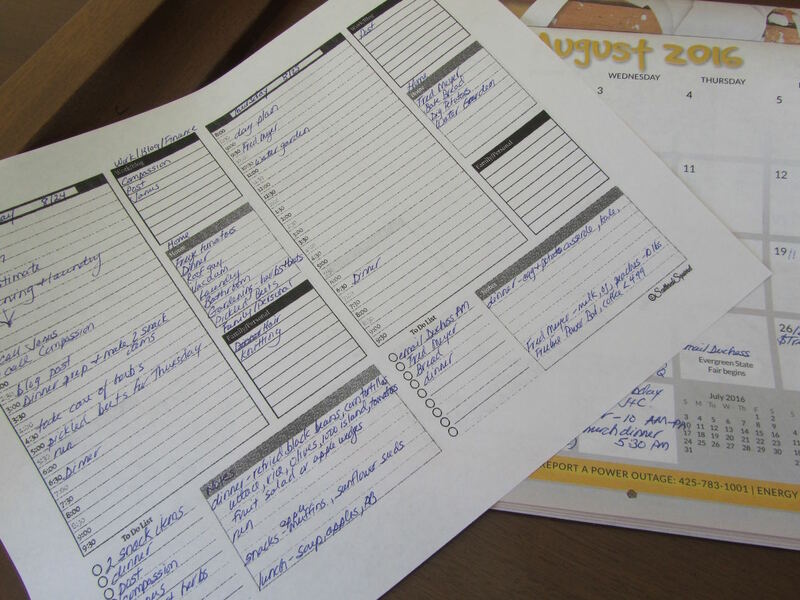 I've experimented with a variety of purchased and print at home planners and calendars. What seems to be working for me is a combination of a month-at-a-glance calendar plus daily planner. I usually get a calendar for free. But in years that I don't, I print out my own month-at-a-glance pages from free online resources. I use the calendar to note appointments more than a day or two in the future. I also use this calendar for week-at-a-glance information. I make general remarks about an upcoming week, in the margin. For example, I need to schedule some work on my car in early September. I just write that in the margin for that first week in Sept, and will fill in an actual appointment when I have it. I like the half-size format, as I can get 2 days on each side of the paper. I print in black and white, and I print about half a month at a time. There's about enough room for me to get all of my info entered for each day. I take about 1 hour each morning planning the day. One hour sounds like a lot of time, but I get more into each day, by spending this time planning. I walk about the house and see what needs doing. I check the garden to see what work should be done there, as well as what produce needs harvesting. I check the laundry to see how many loads I need to do. I check progress on my various projects and crafts. I get out the dinner prep items to thaw. I check the pantry to see if we need breads or snacks prepared or baked. I even look for my lunch for that day. By the end of my planning session, I know exactly what I need to do for the day, right down to what I will quickly make for my own lunch. I keep my planning sheets on a clipboard. I can work on them while propped in bed, while walking about the house, sitting in a comfortable chair, or at the table. I only plan down to the detail, one day at a time. If I fall behind on one day's work, I can push the items to the next day. Or if I don't feel well, one day, I can plan a very light day for myself. It's not a priority that my calendars or planning sheets be pretty. Their primary purpose is function. Pretty would be nice, but not essential. I could purchase a planner. Dollar Tree sells student planners which could work for many people. I need more space for each day than the Dollar Tree planners, however. The larger planners that would work for my needs run around $13 to $16 at Office Depot. By printing out my own planning pages, a year's worth costs me about $4 to $5 (ink and paper). I still use my calendar function on my computer. It's easy to transfer appointment info from emails to that calendar, or to type in to-do lists, while I'm on my laptop working on something else. In the mornings, when I day-plan, I also grab my computer and check for any details for that day and upcoming week. So, I stay organized, and I save money on the tools needed to do that job. Works for me! It's always interesting to see how others do their planning! I am big on planning, myself. I really enjoy it most of the time: budget planning, life planning, sometimes meal planning (this is where I tend to get burned out more). I tried many various planners, then a couple of years back I heard about the bullet method. Not a planner, just a method. So I did buy a pretty notebook to do it in, which ends up to have been a good thing because it looks like the current notebook will hold about 3 years' worth of planning. Everything is in there and I carry it with me so I always have it if I have a few minutes here or there to work on something or I need to write in an appointment. And I was just googling the bullet method thinking I should rewatch the little video as a refresher and saw that they have actually come out with a notebook specifically for this method. But for years it was just a method, and I use a simple Moleskine notebook myself (had features I liked). I read about the bullet methods about a year ago. The concept sounds intriguing, but I never tried it. I'm glad it works so well for you. Calendars are important and since we can't afford the latest techie stuff like iphones, etc. we do have to rely on calendars. I have a 12 month compact desk calendar 17 3/4 X 10 7/8 for home use that sits on the desk in the kitchen. We've learned to only use pencil to put in appointments. We have used a "kids' car and work" calendar that the kids print up and put in their work commitments along with what car they will use (4 vehicles for 5 people) and whether or not they can carpool. I carry a Day-Timer Portable refill 3 3/4 x 6 3/4 in my purse and keep it open at work for work commitments and home commitments. My work calendar starts out so clean and open but by the time the month is over, every single day has multiple entries that it looks like I've been crazy busy. Then there are other things I use to organize our life and that is a spreadsheet with bills in the first column and rows are the month of the year. I fill that in as I pay any and every bill and I can see at a glance where a bill has jumped or if I have not received a bill. I also use that and previous years sheets to know what my budget is. Then there is the summary notebook where all my spending goes into broken into categories so I know every month how much I spent on groceries, prescriptions, health and beauty, cats, and other. It helps a lot to compare year to year when to expect needing to save more for summers when kids are home. We all have our techniques and know what works for us. I just can't see myself doing this on a computer or tablet since I just don't have the money for them and they need charging where a simple calendar needs no maintenance! One of the reasons I find I can't use only the computer's calendar is the computer would need to be on at all times during the day for me. I seem to need to have whatever I use for my day planning to be open, flat, and available to glance at constantly throughout the day. It's a mental thing. Just what I need. Even books don't work for me, unless they're spiral bound or notebook style, so they can lay open and flat, all day. Funny how we can have these little quirks. Our finances I keep in a notebook, and it lies open to the current month, all the time. Like you, I can see if I haven't seen the bill yet for the month. Or I can go back and see when specific bills were high for the year. I do use the computer for my grocery journal. I used to do a shorthand version of that on paper. I love my grocery journal, as I can see prices I paid, how much I bought and when the big sales were for each item. You do what you think works for you, and that is what's best. Early last summer I experimented with the Bullet Journal planning method and it totally changed my life. It's been over a year and I'm still using it. I blogged about it here,http://mykeeponkeepingon.blogspot.com/2015/09/to-do-lists-and-bullet-journal.html after only a few months using the concept. What I love, love, love about bullet journaling is there are no rules. It's a day by day consecutive listing and journaling and it can be whatever you need it to be. I have future planning where I keep track of appointments etc, that are coming later. I'm amazed at how much more I accomplish. You can go to the Bullet Journal blog, http://bulletjournal.com/ for specific details. You can buy an expensive journal or pick up a notebook at the dollar store. It's the method rather than the book itself. I must have read about the bullet journal method about the same time as you. The concept sounds very intriguing, and could possibly be adapted to a variety of planning tools. The key to any system is finding what helps one stay on top of everything they have to do, without feeling like your rushing at the end of the day to get all your to do's in. I'm glad the bullet method works so well for you. I may reread about it and see if there would be anything I could use in my current method. For me, I'm kind of using my small work/home calendar in somewhat the same way as a bullet method. There are things to do in each day with work stuff towards the top and home stuff toward the bottom. The side bars has a "to be done" section and a "notes" section so I can make notes to myself. After 30 years of marriage and 3 adult kids, we just don't really need to remind anyone to do something. My son is quick to wash dishes when he sees them on the counter and someone always seems to watch to dirty clothes hamper and does a load when he/she sees that a load can be done. I've even started cleaning a floor and have one of the kids take the mop out of my hands to finish the job! One day my youngest daughter put on a pair of rubber gloves and started running them over the carpet. When I asked what she was doing she said she was getting the cat hair out of the rugs before taking them outside to shake out! Linda, I do like your journal and maybe I can incorporate something though it sounds like I would have to carry it with me since I'm at work 8 hours per day and that's not helpful at home. I'm a planner and list maker, too. I splurged this year and bought myself a "Happy Planner" that has 18 months of calendars (month and weekly). I also have budget sheets, menu planning sheets, grocery list sheets, etc. I considered it an investment because I have already started designing my own sheets for when 2017 is over. I'll reuse the binding and cover over and over. For years I just used a composition book, but it seems as if life is crazier with adults in the house than it ever was with children....lol. Like you I check my book first thing in the morning. I usually only need about 15 minutes or so to make sure the day is running on track and at the start of the evening I try to verify anything that needs rolling over to the next day (another 10 minutes or so). I keep a daily chore list and work on one or two big items a day so that helps. Oh good for you, for planning your own planning sheets for the coming year. You'll get your money's worth out of the binder, for sure. And it sounds like you've got a system that works very well for you. I like your method of using a clipboard since I usually jot things down on an assortment of papers and lose them on my desk. A bullet method sounds like an interesting way to organize random thoughts so you dont lose them. I think I rather like the idea of indexing...maybe I can adapt features that work and not do the whole bit. I took the plunge this morning, thanks to your inspiring blog post and readers' comments. I used my granddaughter's composition tablet salvaged from her school year long ago. I decided on doing a quasi bullet journal, using an alphabetical index A to Z instead, followed by journal entries. I had notes already scribbled on pieces of paper on my desk, so after numbering the pages, I started rewriting my notes under different subject headings, like garden, kichen, stores, grandchildren, crochet, computer...then I underlined the heading as well as words in the text that I wanted indexed with a red pen. For recipes, DIY instructions, substitutions, or anything lengthier that could stand as a body, I used the back pages, and headed each as a separate appendix. For my needs, I would rather keep this as a journal of ideas and information. For a today "to do" list, I clipped a piece of paper and pen to the sturdy front cover of the composition tablet to use as a clipboard. I already have a calendar with important dates marked, a computer post it feature on my desktop that lists various tasks to keep in mind by critical date order, and my Microsoft Works files for financial and other record keeping. I need to work on my recipe files one day, it is a complete mess. Lili, would you mind sharing your system for keeping your recipes organized? I hope your new implementations for organization will work well for you. I think we all find our particular method, which works for us. The key is to tweak your system until it fits you just right, and you can maintain it over the long haul. I need to work on my own recipe organization! Aside from my cookbooks and 1 recipe file, the majority of my recipes on papers still need to be converted to cards and organized. Right now, I have a small box (shoebox size) full of papers with recipes that I've collected. I'll let you know when I finally get those organized. I have part of it started, but I need to work with it and see if my method would work in the long run. Then I'll let you know all about it. Thank you. It will be interesting what you decide to do. I still rely on hard copy recipe, yet the internet is playing a larger role in the search for new recipes, hence my online recipe file is growing. I have some recipe books from the old days, but I hardly buy new ones. I was thinking of keeping my printed recipes in a binder instead of an index card file, although I still have my old recipe index cards too. Hm, the bullet journal is an interesting idea. I'm with Alice--I need something small that can fit in my purse. I just got a smartphone and I am trying to use the calendar on it, but at least at this point, it feels cumbersome. I have noticed that a lot of people with smartphones still use a paper organizer so maybe it's not all it cracked up to be? Regardless, now that my mom is living near me and I am helping her with so many things, I need to step up my organizing efforts. Yeah, I think if you work outside the home you need something you can take with you, that closes neatly, holds everything in, and is easy tor refer to throughout the day. You may find that your smart phone becomes easier to use for storing data. Think of all the technology that we never thought wed be able to adapt to, but now use in our lives every day. How is your mom doing? That's nice that she's living closer to you, now. Your visits can be much more frequent and you can squeeze them into your busy life, without major interruptions. But it does place a burden on you to take care of some things for her, simply by being so close. It's good, though, I'm sure. I just spent the past hour figuring out the calendar on my phone. I don't have it completely figured out, but I was able to input the next 4 month's worth of activities on it. I don't think I will ever be without my paper calendar--I feel like my whole family needs the at-a-glance info it provides--but yes, I am hoping the phone becomes my link for when I am out and about. I did pretty well with remembering everything for the 4 of us, but with all of mom's appointments, etc., I need help to keep up on everything! Mom is doing ok. She misses her friends/church and is struggling with her limitations (her worsening eyesight, primarily--she isn't supposed to be driving ... we're still working through that one). She has been having problems with falls for a few years now. She and I went to her new primary physician yesterday and (woohoo!) he is a wonderful Christian man who listened to my/our concerns and is getting her in with a PT who specializes in balance disorders. This is something I have tried to encourage for at least 3 years, but it was next to impossible to make happen when we lived so far from each other. I want her to live as healthfully and independently as possible for as long as possible, and the falls scare me, because I know what that can do to a person's independence. So ... yes, it does place a burden on me. Mostly I am ok with this, but sometimes it just seems like sooo much to be taking on. The availability of hours for me to work drastically dropped last winter and I did some job searching (was even offered a position, which felt good--the older you get in the OT world, the more that becomes a concern) but after much prayer/soul searching, I think that now is not the time for me to be making major job changes in my life. If I can't get hours, well, maybe God has other plans for how I use my time. Thanks for asking--that was a long answer to your question! I's glad your mom is doing okay, Kris. I've always heard that moving becomes more difficult as we age. It sounds like she's getting really good care. I know that must be a relief for you. And maybe you're right, maybe God wants you to reserve energy for family, right now. I'll keep you in my prayers. It to lay flat on the table so I can take a look every morning. I love that idea to use the different colored spirals for different "topics"! I like mine to lay flat and open everyday, too. I feel the need to be able to see it at a glance. As seen in the comments everyone has a different way of organizing themselves. However, there was a very important comment in your post that you spend an hour in the morning planning. Taking time to think through everything is a very part of making a plan. (However, if I'm not careful, I spend all my time thinking and not any time doing. I guess it all takes a balance.) My main point is really that all the really efficient things you do don't just happen. It takes thorough planning and hard work. It took me years to realize that I needed time to do the actual planning. And I don't know why I didn't learn that earlier. Planning is one of those skills that I don't think they teach well enough in school. Maybe not everyone needs as much tie for the planning, as I do, but some time to plan is necessary, to save time and extra work later on.